Island escape? Texel has it all! Bucharest is not your average weekend destination but the last years the city is changing and you will be surprised by the great vibe it has to offer now. The city centre has undergone an amazing renovation and Bucharest is anything but boring. The layers of history are clearly visible and sometimes juxtaposed next to each other. You can uncover them one by one, starting from Ancient Dacia (not the car, although they are related), continuing to Wallachia, the Ottoman Empire, Little Paris, Communism and present day. Bucharest is amazing – full of stories but never looking back, going forward with a stiff upper lip. 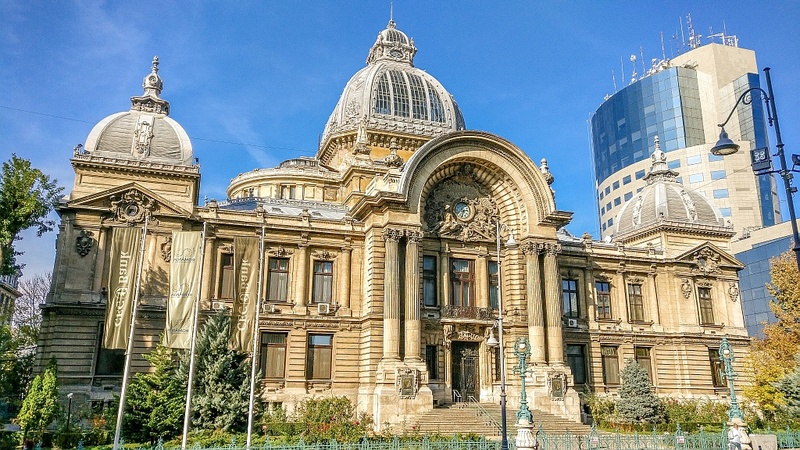 Romania’s capital Bucharest is an up-and-coming city trip destination, a bit off-the-beaten path, still authentic and very real. Give it a go and you will be surprised! Tip: On 1 December 2018 Romania just celebraated its centennial anniversary. Isn’t that enough of a reason to head to its capital – Bucharest? 1 How to get to Bucharest? 2 What to do on a weekend in Bucharest? 3 Where to stay in Bucharest during your weekend trip? DISCLOSURE: This post contains affiliate links. If you book a tour or a hotel using the links below immediately after you have visited my page, I will earn a small commission at no extra cost for you. How to get to Bucharest? To optimize your weekend escape, the best will be to fly in to Bucharest’s Otopeni Airport. All big European airlines fly to Romania’s capital, as well as some low-cost ones, like WizzAir, Ryanair and Romania’s own Blue Air. The airport is not very far from the city and although there’s public transport available, taxis and ride-sharing services (Uber or Taxify) are pretty affordable. I myself used a taxi. What to do on a weekend in Bucharest? A weekend is a short time to explore a city, the size of Bucharest, but it’s enough to see the highlights and get an idea of its vibe. The Old Town is Bucharest’s thriving heart. The old city centre has been renovated in the last decade and today it’s a favourite place for tourists and locals alike to hang out. There are numerous restaurants, bars and cafes, but the Old Town is not only about partying. Here you will find some hidden treasures, like Manuc’s Inn (Hanul lui Manuc) – a beautifully refurbished building from the Ottoman period. Built n 1808, the caravanserai, or khan, was the biggest and most important commercial centre of Bucharest in those days. Today, it’s a lovely restaurant. Near Manuc’s Inn is the oldest preserved active church in Bucharest – the Annunciation Church of Saint Anthony (built in 1559) and the Old Princely Court (Curtea Veche) – one of the residences of the infamous Vlad III the Impaler (Vlad Ţepeş or Vlad Dracula). At this moment the Old Princely Court is undergoing restoration works and can’t be visited. Another place not to be missed in the Old Town is the Stavropoleos Monastery – a fine example of Brâncovenesc architecture – with beautiful arabesque columns and frescoed outer and inner walls. The church was built in 1724 and the monastery is still active today. Tip: Discover the Old Town with a free tour organized by Walkabout Free Tours. The Old Town in Bucharest is also home of some architectural jewels from the Belle Époque. In the 19th century and early 20th century before WWI Bucharest was changing rapidly and from a rural settlement it was quickly turning into a modern city copying the crème-de-la-crème of that period – Paris. This is also why Bucharest was nicknamed Little Paris. Most of the buildings are beautifully restored but many of them are in quite a dilapidated state. Tip: If you want to learn more about why Bucharest was nicknamed Little Paris or Paris of the East, my advice will be to book the Little Paris Walking tour with Good Living Tours. Bucharest has its very own version of the Vatican – the seat of the Patriarch. In the Eastern Orthodox the separate countries have autocephalous churches, which means that the patriarch is independent to the contrary of the Catholic Church where the power is centralized in the Pope. When walking around, take a close look at the Palace of the Patriarchate (Palatul Patriarhiei), doesn’t it remind you of the Paris’ Opera Garnier? This is one of the newest attractions in Bucharest – an amazing water ballet, a combination of multimedia, water and music. After a 7-million-euro thorough revamping, the fountains opened again in September 2018 with a grandiose show accompanied live by the Bucharest Symphonic Orchestra. You can see the water show on Friday, Saturday and Sunday evening from 20:00 to 21:00 as long as the weather allows it. I was so lucky to be able to see the last performance for 2018. Only the fountain show is a reason enough to book your weekend trip to Bucharest! You can’t visit Bucharest and avoid its communist past. Communist architecture is everywhere. It dominates the city skyline of Bucharest and its straight lines deprived of any charm and decorative elements contrast harshly with the Art Nouveau and Art Deco sumptuousness. There’s one place in Bucharest you have to visit to understand what happened in 1989 and this is the Revolution Square. Here, from the balcony of the building of the Central Committee, Nicolae Ceaușescu (the communist leader of Romania) had his final speech on 21 December 1989, which marked the beginning of the end for the communist regime in the country. The events that followed cost the life of almost thousand people. The Romanian Revolution was the most violent overthrow of a communist regime in the countries of the Eastern Bloc following the fall of the Berlin Wall. At the Revolution Square you can’t miss one of the most controversial monuments in Romania – the Memorial of Rebirth, dedicated to the victims of the Revolution. Although it was erected in 2005, the monument is in a very bad state and has been vandalized a few times since then. It’s referred to as “a potato skewered on a stake” or “an olive on a toothpick”. To me, it looks like Tangela hanging halfway on an ice rock (Note to self: don’t play so much Pokémon), or a tumbleweed caught on a stake. What’s your interpretation? Tip: I highly recommend the Communism Tour organized by Open Doors Travel. You can book the tour here. Bucharest has many beautiful parks to choose from: the romantic Gradina Cişmigiu, the vibrant Herăstrău Park with the lake, or Carol Park with the great viewing points. There are also many smaller parks and green spaces scattered all over Romania’s capital. If you are spending only the weekend in Bucharest, then you won’t have time to see all parks. My advice will be to choose for the Carol Park (Parcul Carol). The monument perched on the top of the hill is an ex-mausoleum of Romania’s communist leaders and activists. In 1991 the mausoleum was repurposed into a monument dedicated to the Unknown Soldier where the remains of soldiers died in WWI were moved in and the communists were exhumed. The park itself was built in 1900 and hosted the Bucharest Exhibition in 1906. Climbing the stairs to the Monument of the Unknown Soldier is absolutely worth it as you will have an amazing view over the city from the top. From there you can spot the second largest administrative building in the world – the Palace of the Parliament (Palatul Parlamentului) and the largest Orthodox church in the world to be – the People’s Salvation Cathedral (Catedrala Mântuirii Neamului), which was supposed to be finished in time for the 100th anniversary of Romania. When I visited Bucharest in early November 2018, it was still under construction. At the edge of the park there’s a hidden castle that not many tourists know – a replica of Vlad the Impaler’s Poenari Citadel (Cetatea Poenari). The castle was built for the Bucharest Exhibition to mask the water tower, which actually never worked. Unfortunately, the castle can be visited only twice a year – on Accession Day and on 25 October (the Army Day), but you can still admire it from outside. Where to stay in Bucharest during your weekend trip? Grand Hotel Continental – although quite luxury, this beautifully renovated and refurbished 5-star hotel is pretty affordable. Stay there for an ultimate Little Paris experience. Check prices and availability for Grand Hotel Continental. Rembrandt Hotel – located just at the corner of the historic city centre, this 3-star hotel is super comfy and with the perfect location. Check prices and availability for Rembrandt Hotel. Little Bucharest Old Town Hostel – the perfect choice for those travelling on budget. The hostel is located in the lively Old Town. Check prices and availability for Little Bucharest Old Town Hostel. I have visited Bucharest as a part of a press trip, organized by Experience Bucharest, where all accommodation, meals and activities listed above, were provided by the Experience Bucharest and their partners. However, all opinions expressed in this post are mine. Have you been to Bucharest? Which are your favorite places in Romania’s capital? Share with us in the comments. Or maybe you have questions, let me know in the comments and I will try to help you. I love Bucharest! Such an awesome and beautiful city. Your photos are so pretty makes me want to go back! I definitely need to visit Romania one day. These photos are stunning! Thank you for sharing. © 2017-2019 - Ipanema travels to... All Rights Reserved. All content in this blog, including texts and photos, is copyright of the author. Unauthorized use and/or duplication of this material without express and written permission from this site’s author and/or owner is strictly prohibited.